New Age Kurling is a form of the original curling game, but adapted so that it can be played indoors on any smooth, flat surface, such as a sports hall, rather than on ice. We have been playing New Age Kurling in Barby since March 2006. 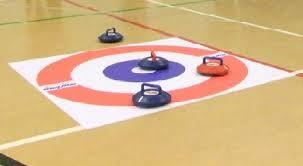 The Kurling Club meets in Barby Village Hall (Main Hall) every Monday afternoons from 2:00pm to 4:00pm. The club welcomes players of any standard and does not play in any leagues - only for fun. We charge only £2 per session to cover the hall cost, all equipment and of course tea and biscuits. If you are interested in joining then contact Jan Middleton on 01788 891968. For more information on Kurling click here.